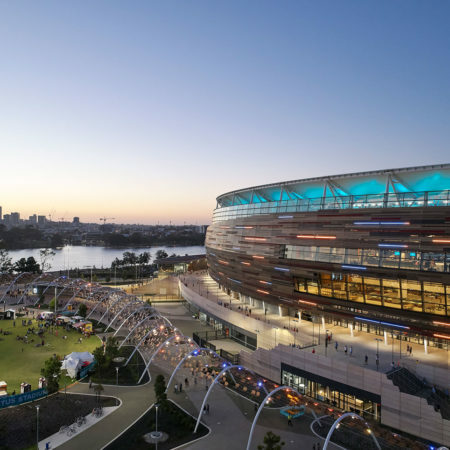 Stadium Park on the Burswood Peninsula in Perth, Western Australia is home to the city’s new Optus Stadium. 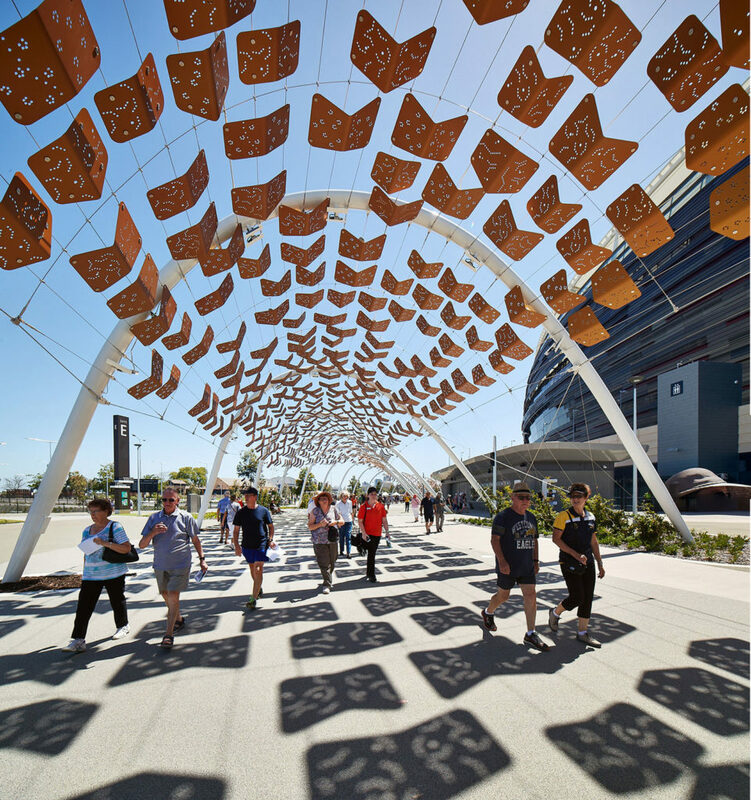 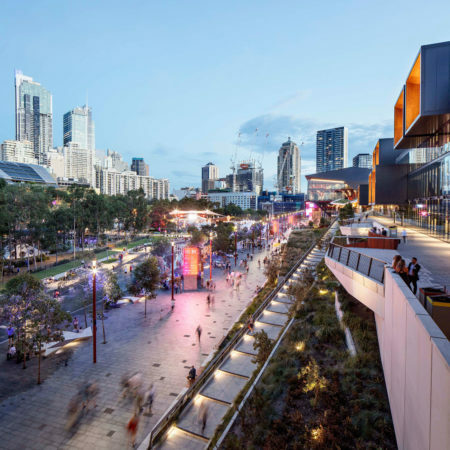 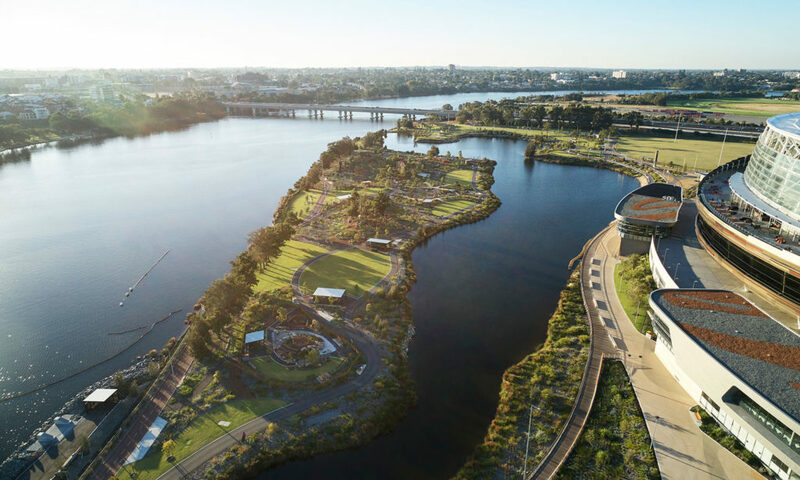 The 41-hectare precinct, designed by HASSELL, provides a stunning parkland setting for the world-class sports and entertainment venue, as well as an impressive array of casual recreational facilities for Perth’s community, and visitors, to enjoy year-round. 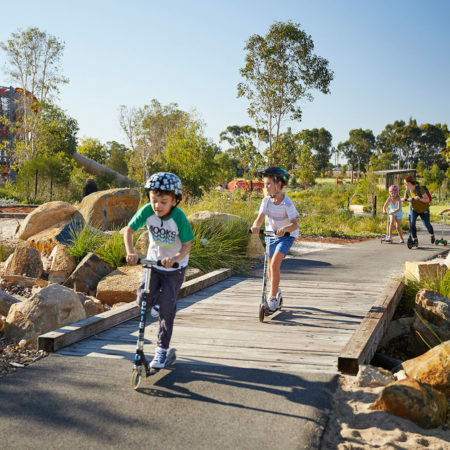 A major attraction within the precinct is Chevron Parkland, a 2.6-hectare nature-play space that’s designed to engage children and families with the natural environment and connect them with the indigenous cultural heritage of this land known to the Aboriginal community as ‘Wadjuk Noongar’ country. 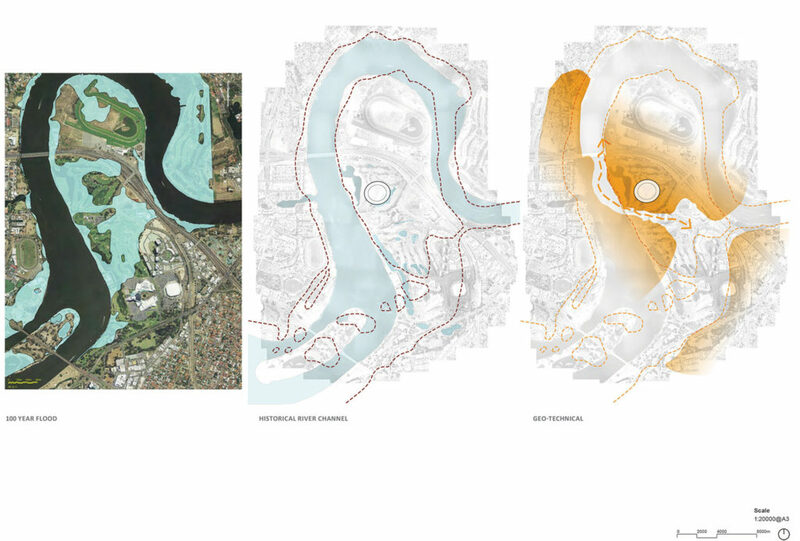 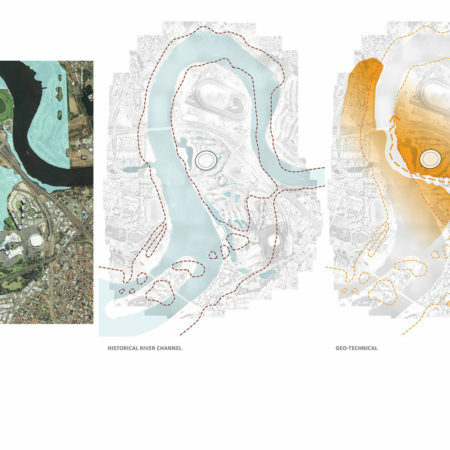 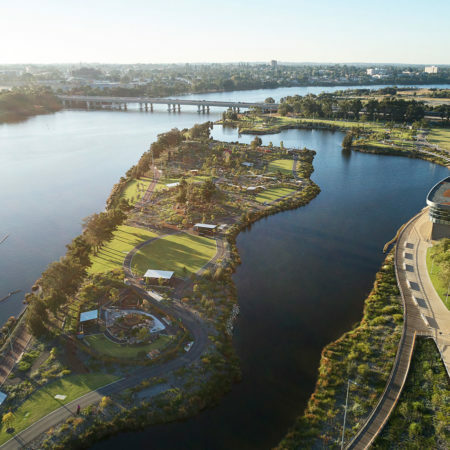 Significantly, the Stadium Park development has rehabilitated this prominent site on the eastern foreshore of the Swan River – once a waste ground of the city – to provide a collection of scenic promenades, cycle paths, and flexible event and play spaces, filled with landmark public artworks. 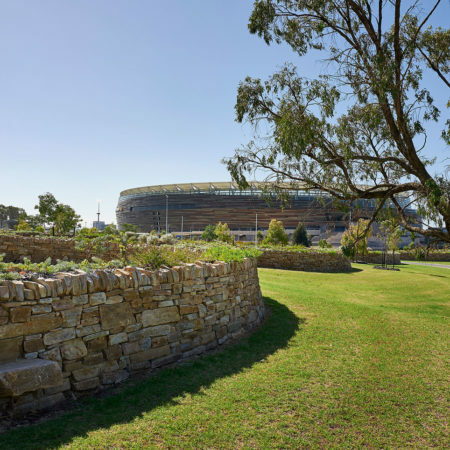 The Stadium Park site had endured significant environmental degradation over many years, due to its past uses as a sewerage treatment facility, cement works and rubbish tip. 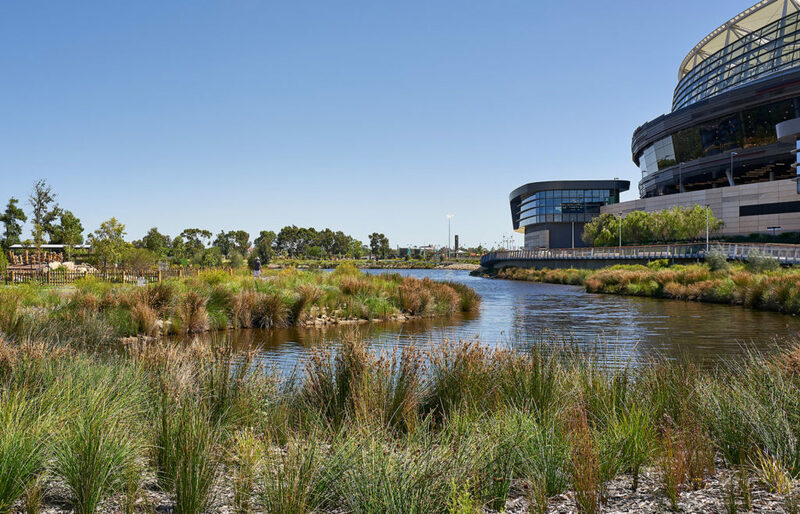 The Chevron Parkland site presented its own challenges, with its location between the river and the lake making it prone to geological instability and flooding. 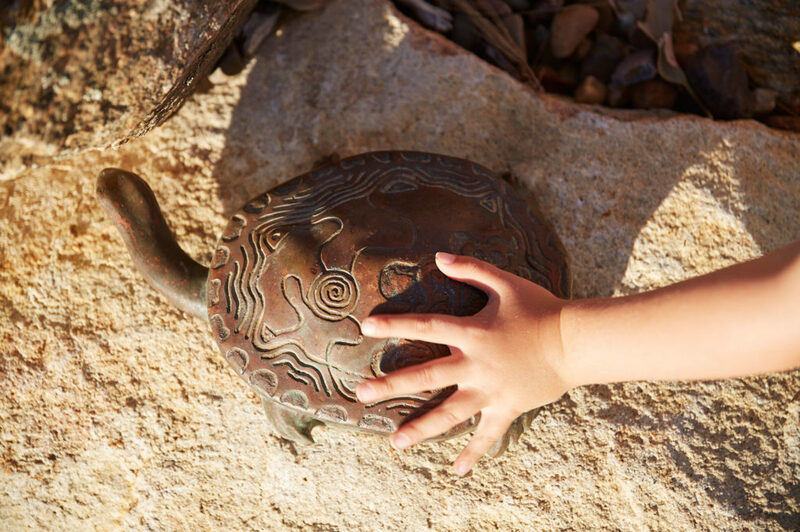 We rehabilitated the entire site, making it safe for the community and local wildlife. 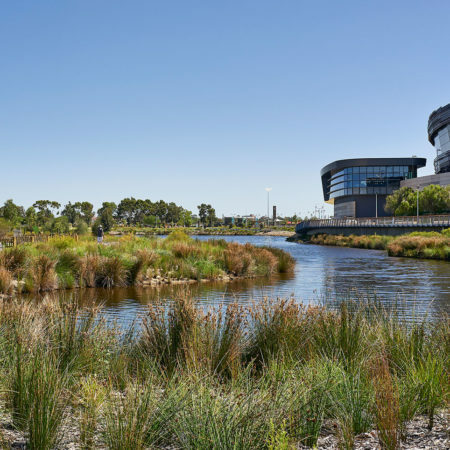 The capping of contaminants in latent soils, reduction of fertiliser use, and bio-filtering of surface water has improved the micro-organisms found in both the soil and the water. 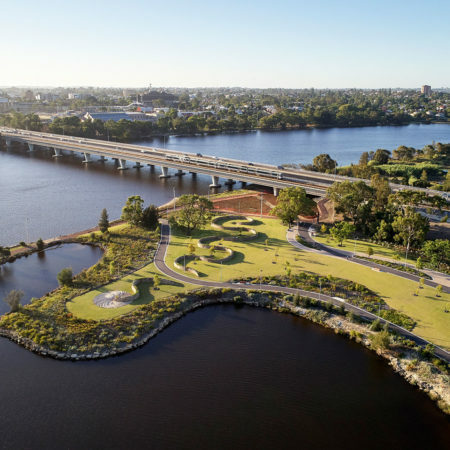 Site flooding has been mitigated through the creation of a series of mounds and undulations; with key play structures situated above the 1-in-100-year flood level and incorporating deep pile footings. 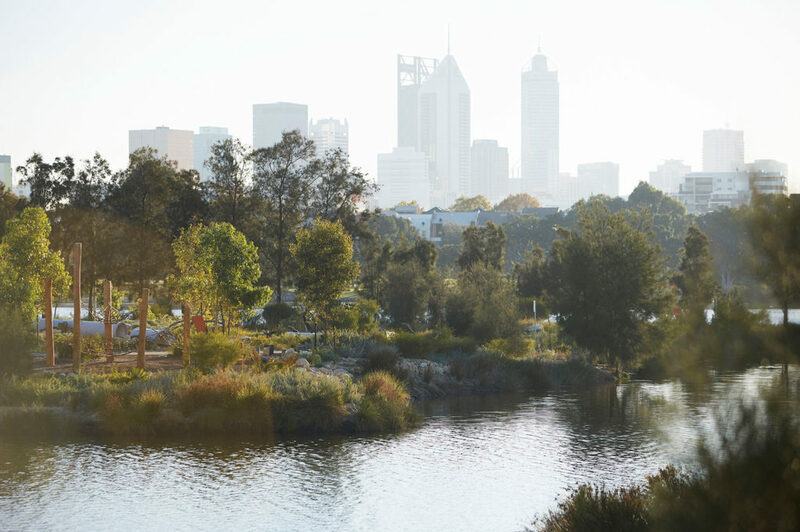 Our design has introduced thousands of native plants creating a beautiful native setting with spectacular vistas across the river to the city. 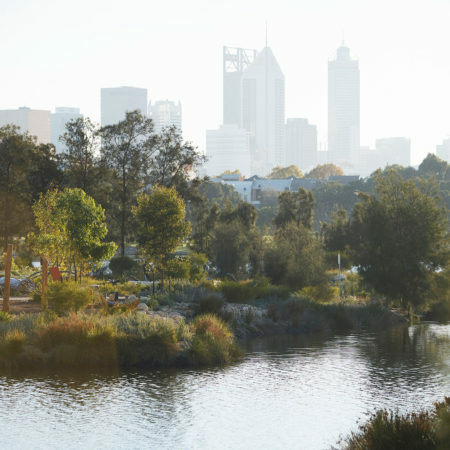 This naturalisation of the parkland and its lake and river edges, provides habitat and food for endemic insects, fish and bird life – including species suitable for foraging by the endangered Black Cockatoo. 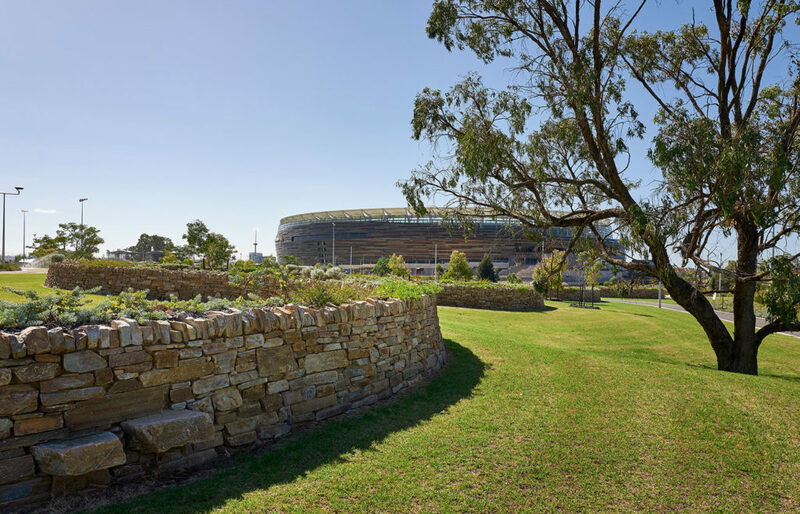 Native wildflower planting for endemic fauna also supports the cross pollination of plant life throughout the area. 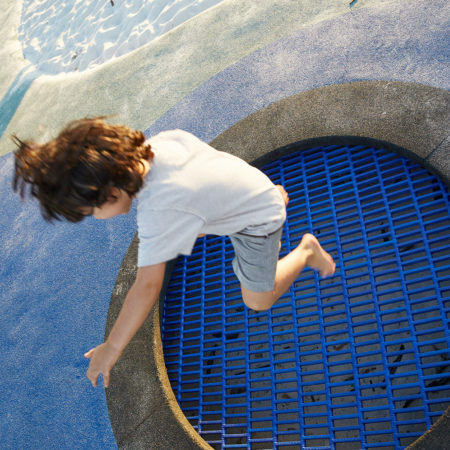 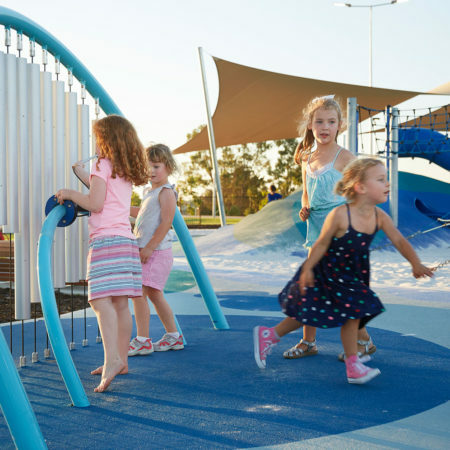 Risk consultants and the Royal Life Saving Society assessed the waterside play area – informing our positioning of pathways, bio-engineering to water edges, benching of banks, sightlines, signage and CCTV. 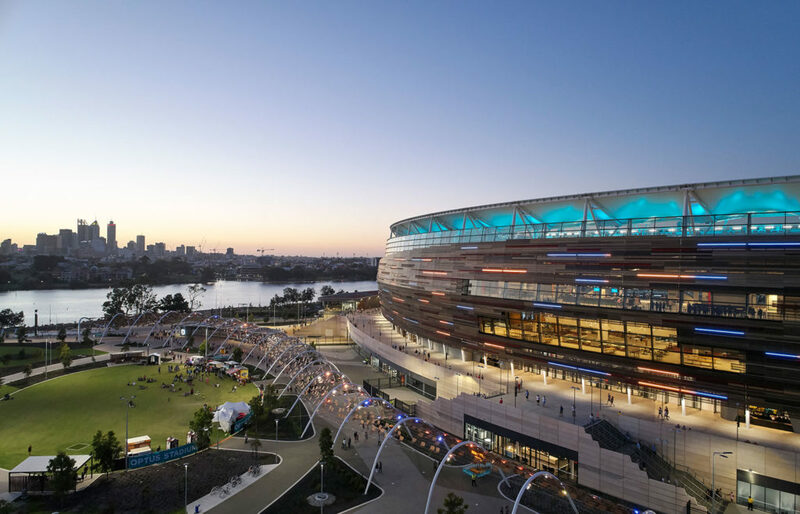 At the beginning of the design process, we asked the Wadjuk Working Party (as representatives of the Wadjuk people) how they would like their culture to be represented across Stadium Park. 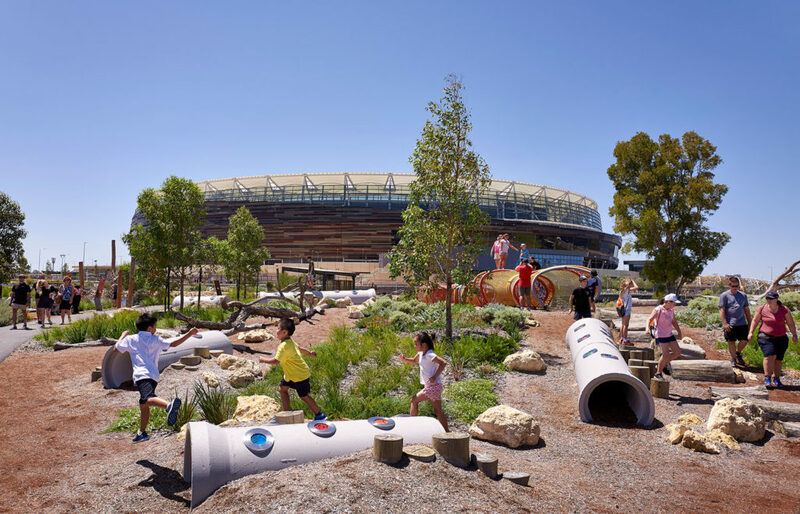 They identified the Noongar ‘six seasons’ as the overarching theme to express the Aboriginal connection to the land (country) in balance and harmony. 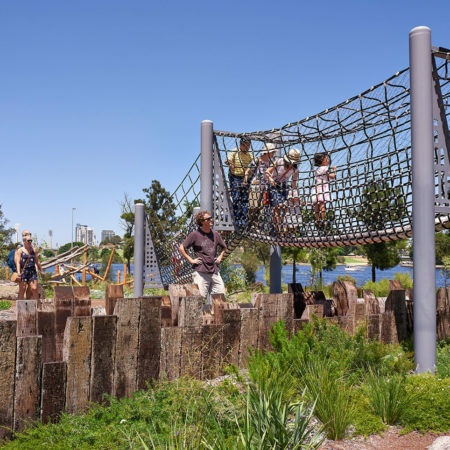 From this idea, we collaborated closely to integrate interpretive elements throughout the landscape design. 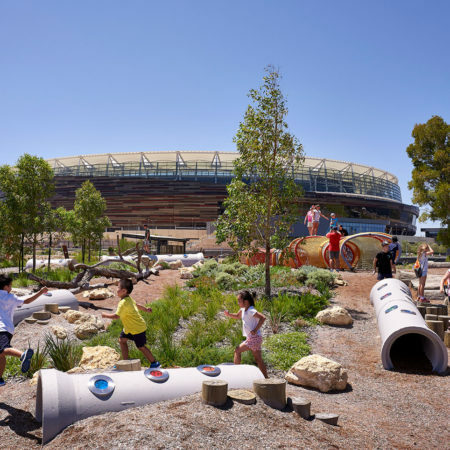 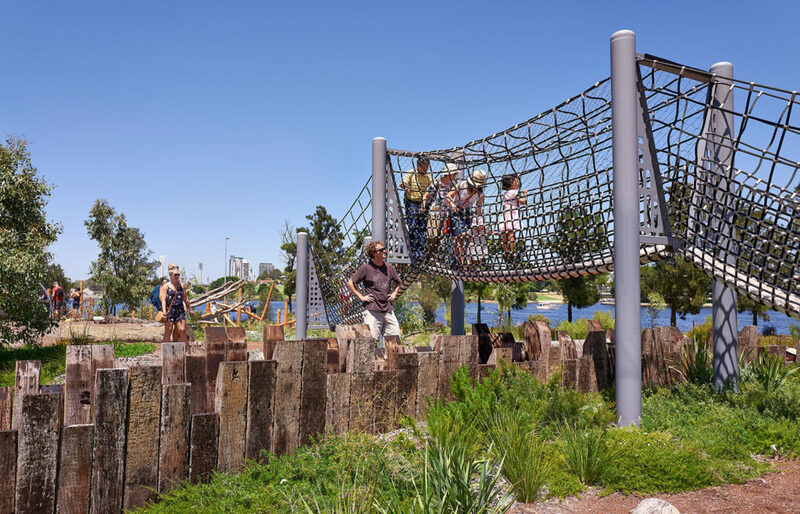 Chevron Parkland comprises six key zones, each representing one of the Noongar seasons – Djeran, Makuru, Djilba, Kambarang, Birak and Bunuru – through planting palettes, materiality, nature-play themes, and interpretive educational signage. 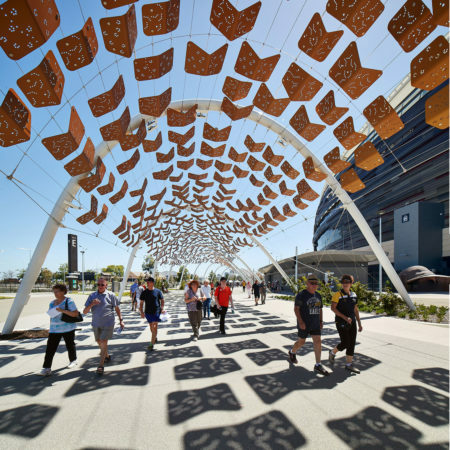 A collection of 14 public artworks is also woven through the landscape. 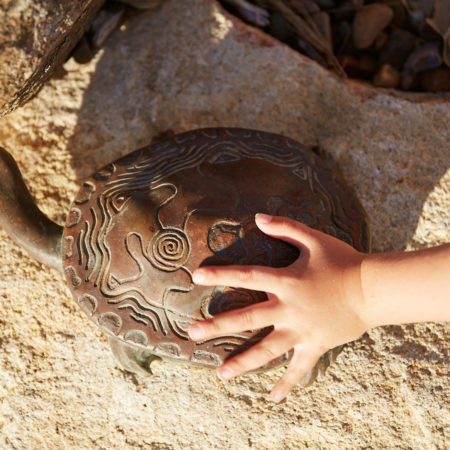 Ten of these works are by indigenous artists, with eight of the artists from the local Wadjuk community. 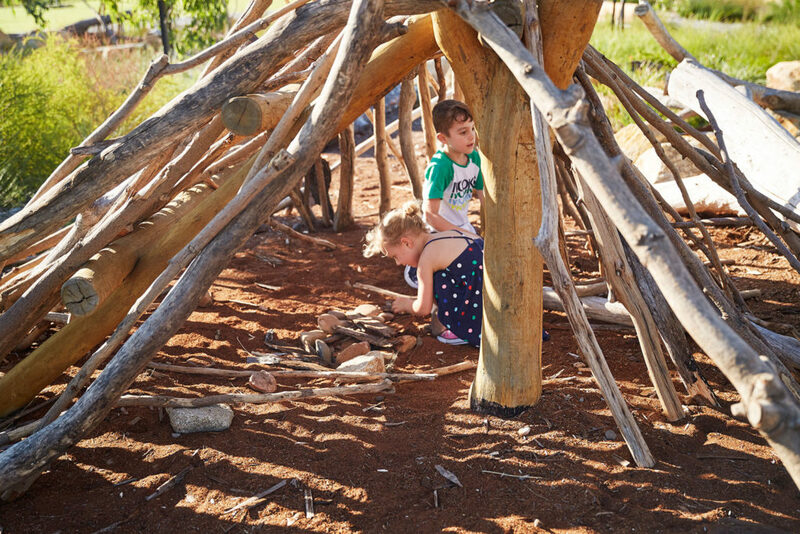 In these unique and intriguing spaces, visitors can gain a sense of the culture and learn more about indigenous traditions and how they relate to the environmental conditions of each seasonal change. 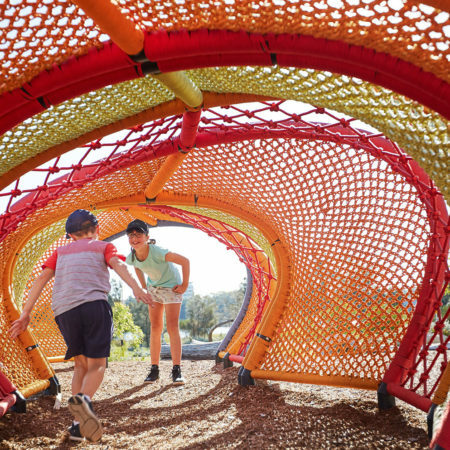 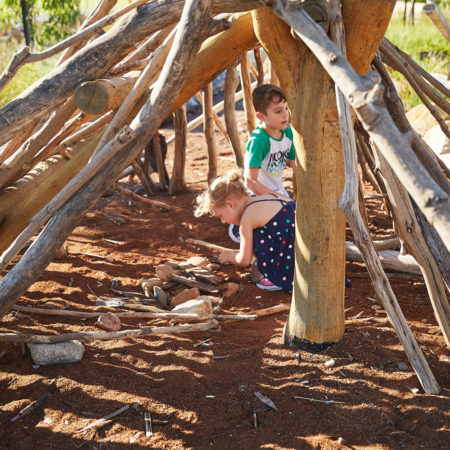 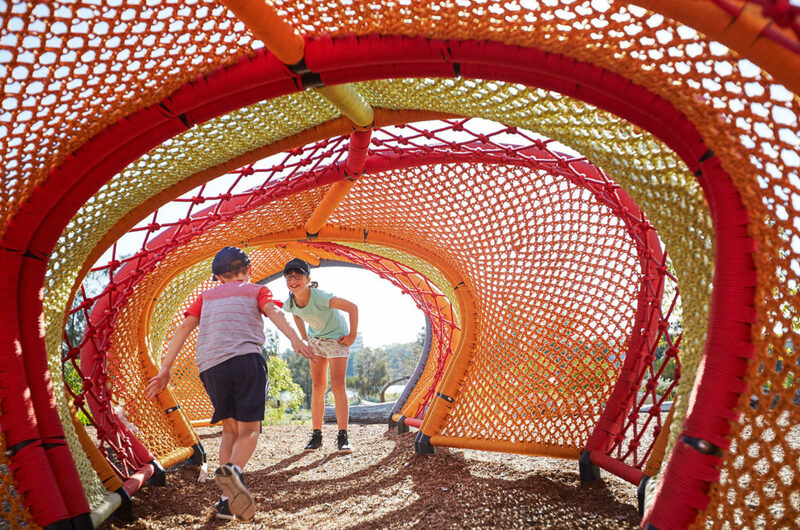 For example: Birak season is the ‘first summer’, when temperatures rise, so this play-space is about finding places to beat the heat – like the ‘numbat burrows’ and tunnels that create a cool, sensory space with rich textures and colours to explore. 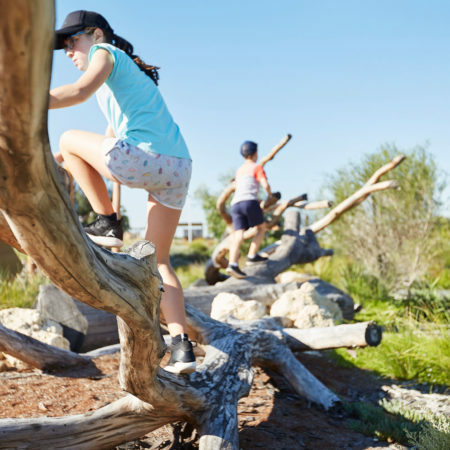 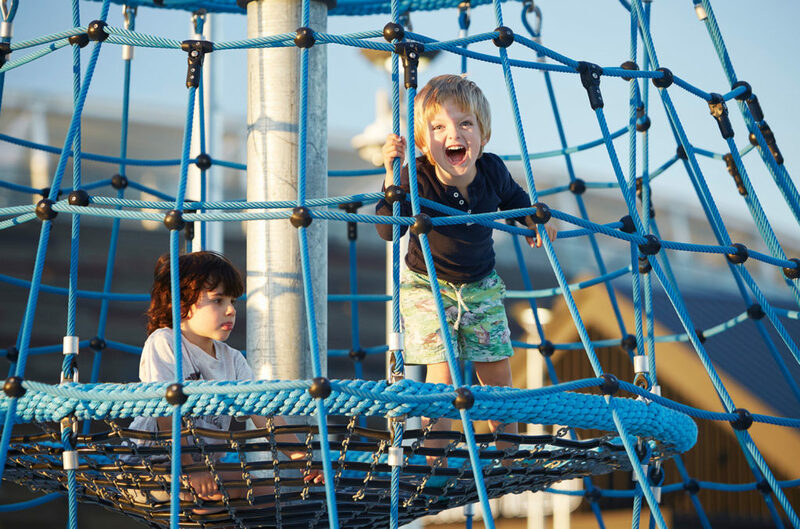 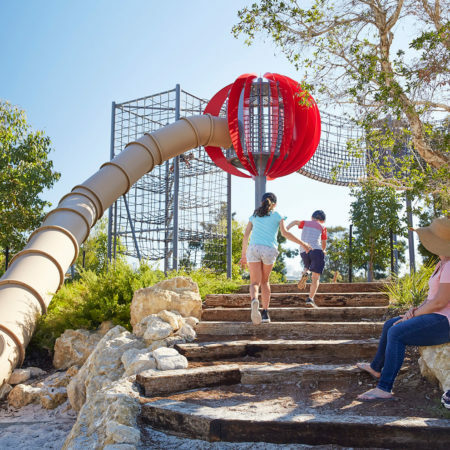 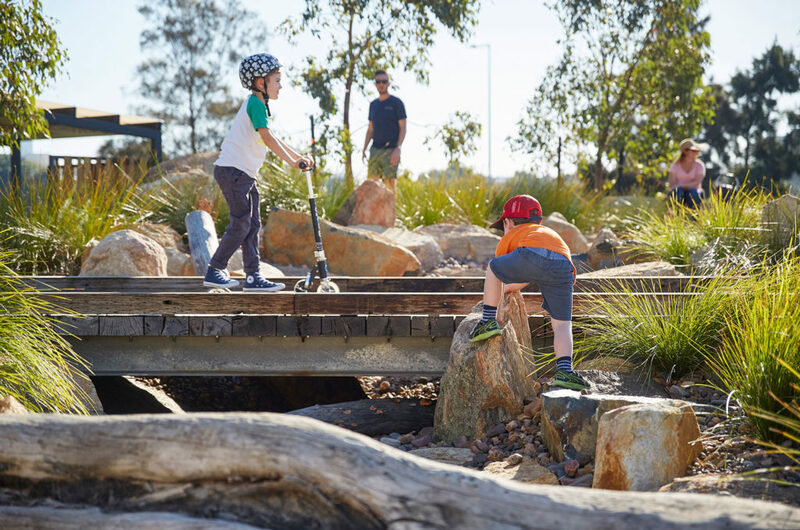 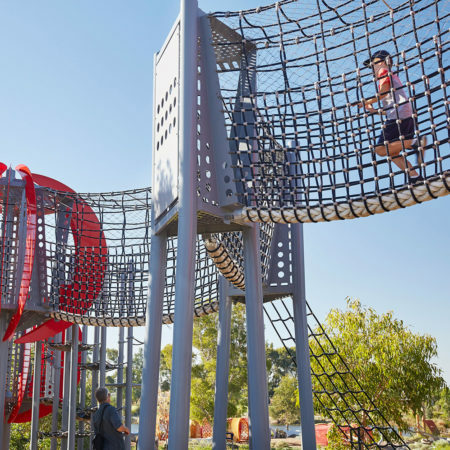 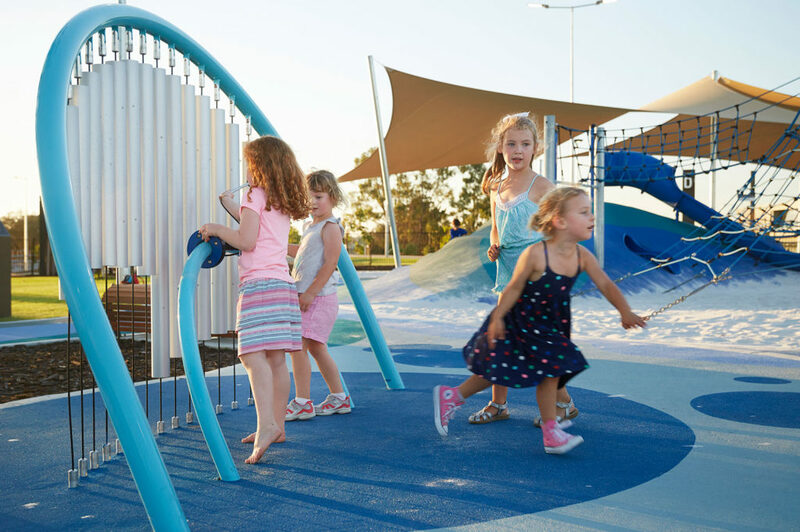 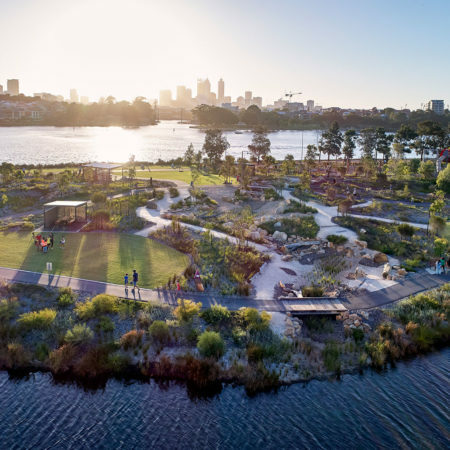 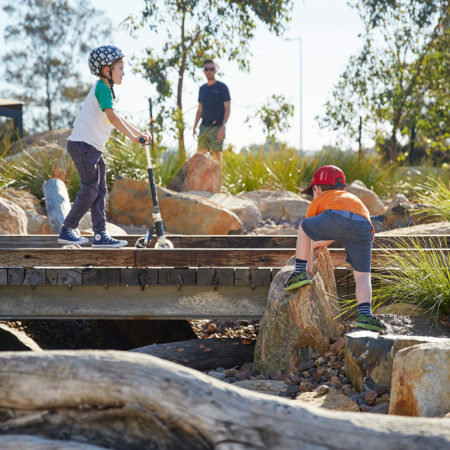 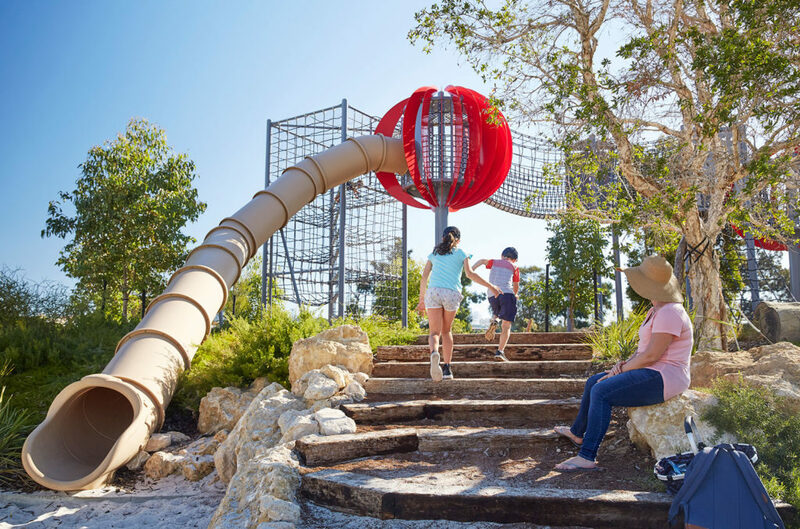 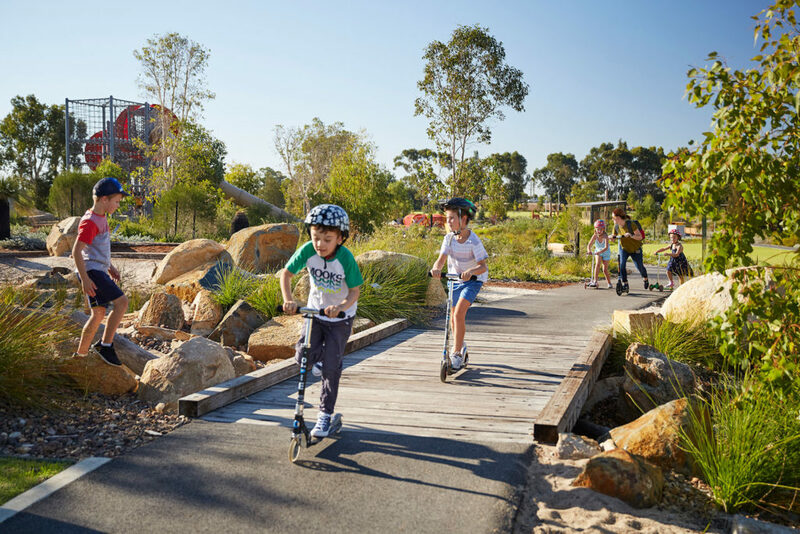 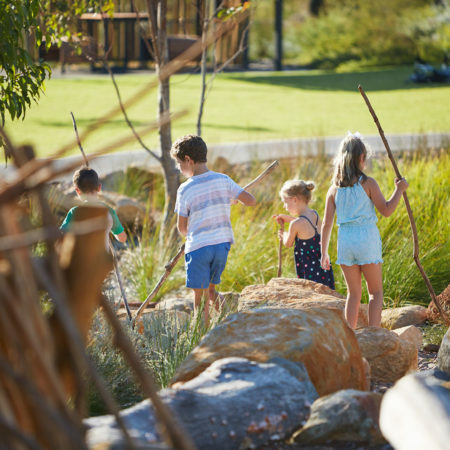 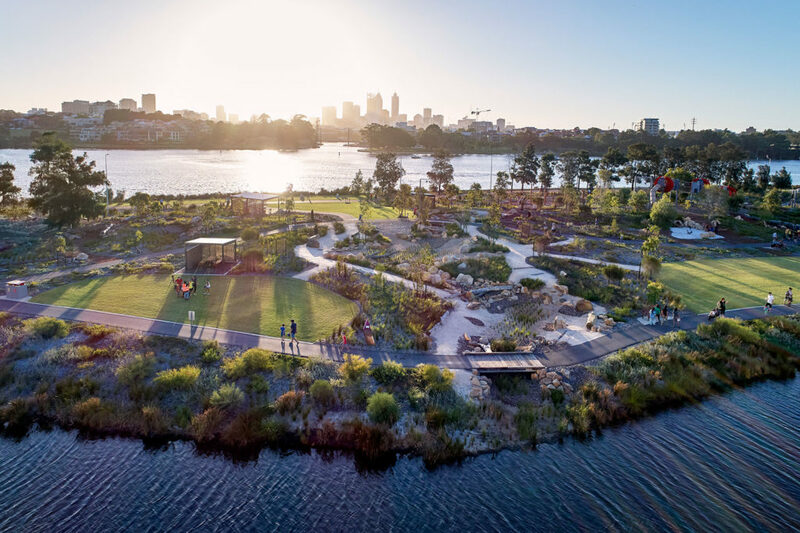 Another key objective of the Chevron Parkland design was to create an expansive area of urban bushland, where children of all ages can play safely with opportunities to roam free, fully immersing themselves in the natural environment. 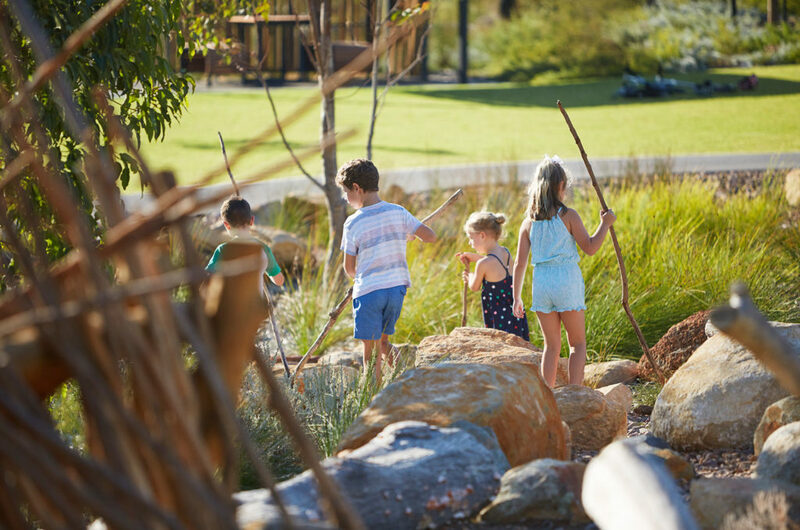 We want children to discover their passion for nature at Chevron Parkland. 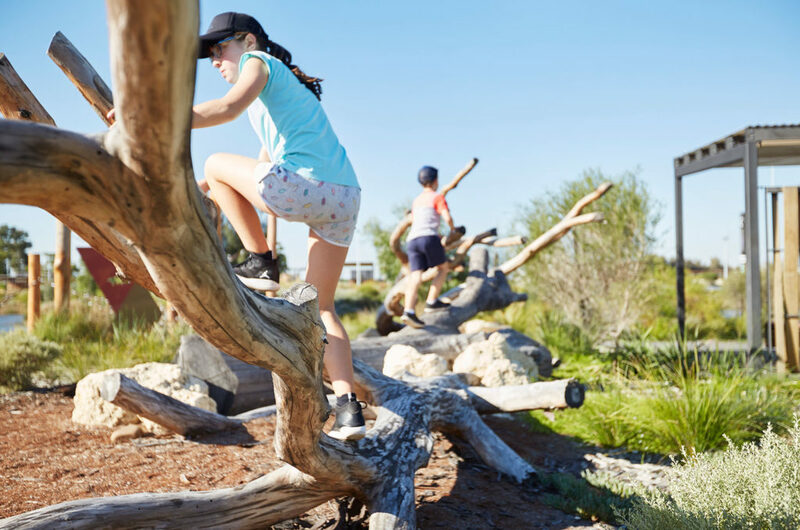 Ideally, they will become the stewards of the park – shaping its evolving character through the migration of sticks and stones, the building of forts and cubbies, and forming new paths, lookouts and dens. 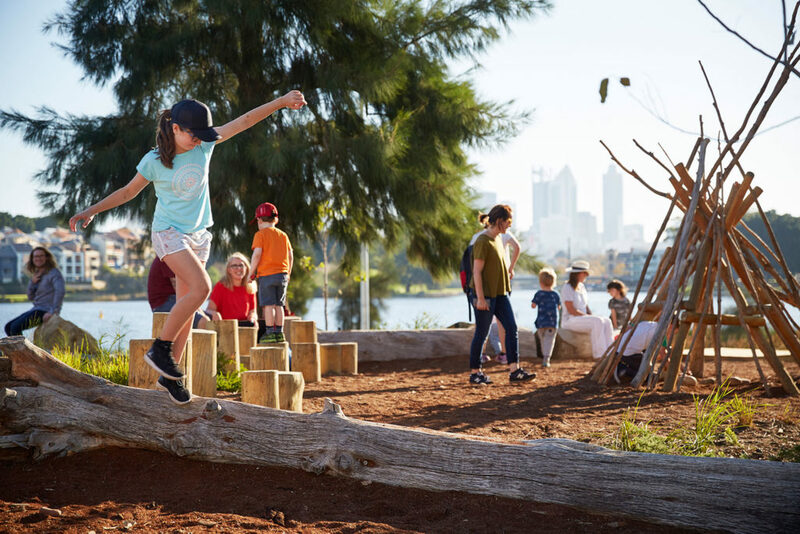 To encourage engagement and creativity, a series of nature-play zones were created offering a mix of structured and unstructured activities. 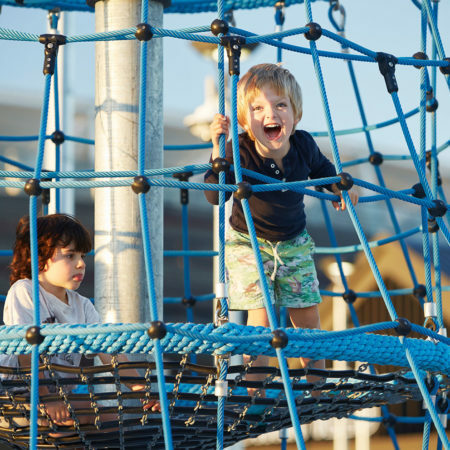 They include various climbing, balancing, tunnelling and ‘chill out’ elements, with sand pits and lookouts. 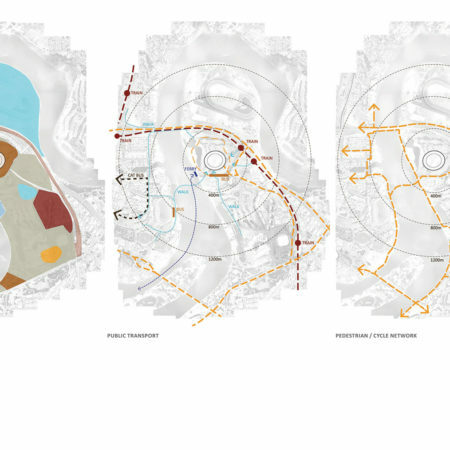 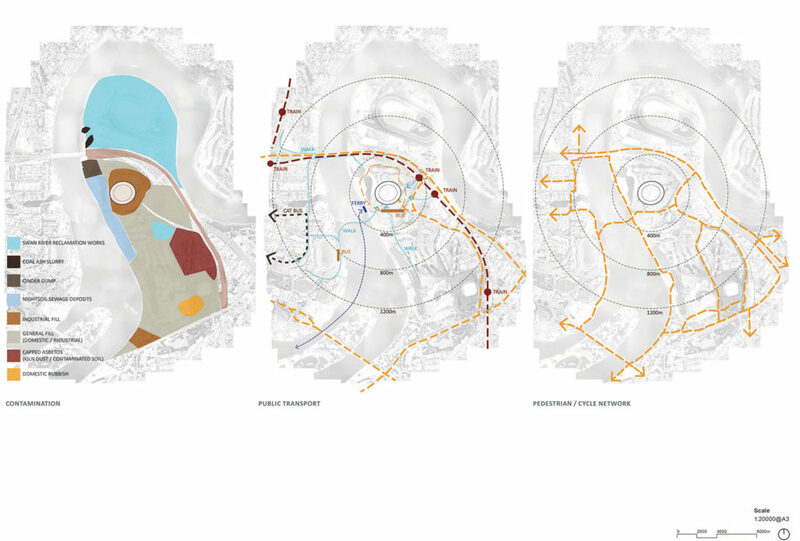 Each zone is separated by indigenous planting, creating a sense of discovery and adventure between activities. 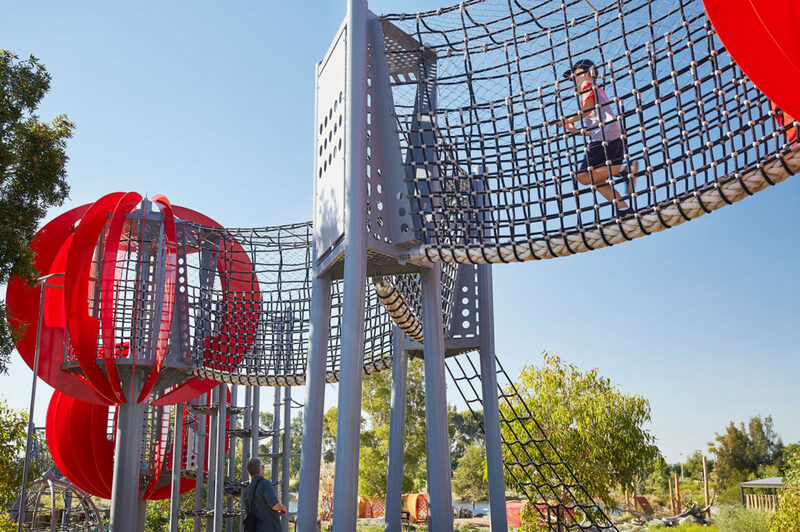 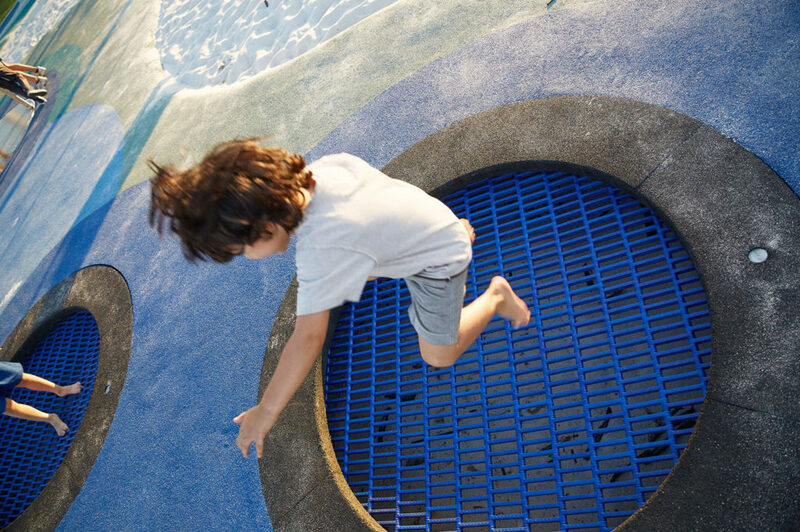 The wider Stadium Park also incorporates a more structured sensory place-space, with musical instruments, trampolines, climbing ropes and more. 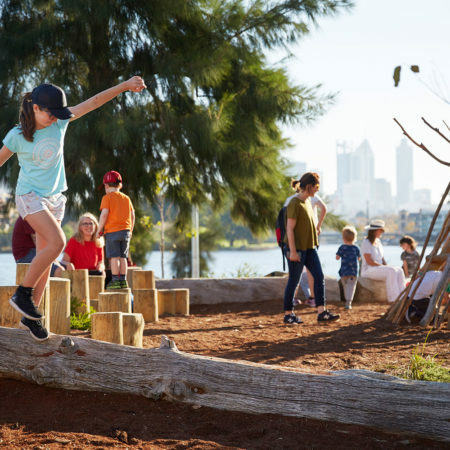 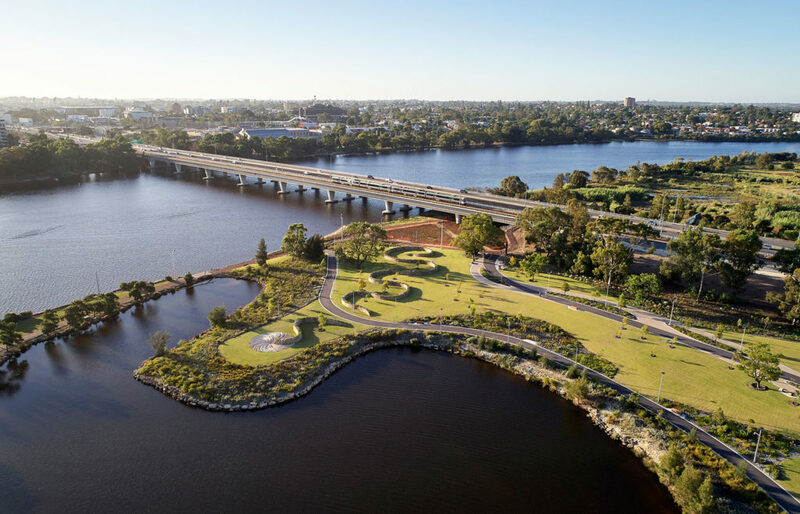 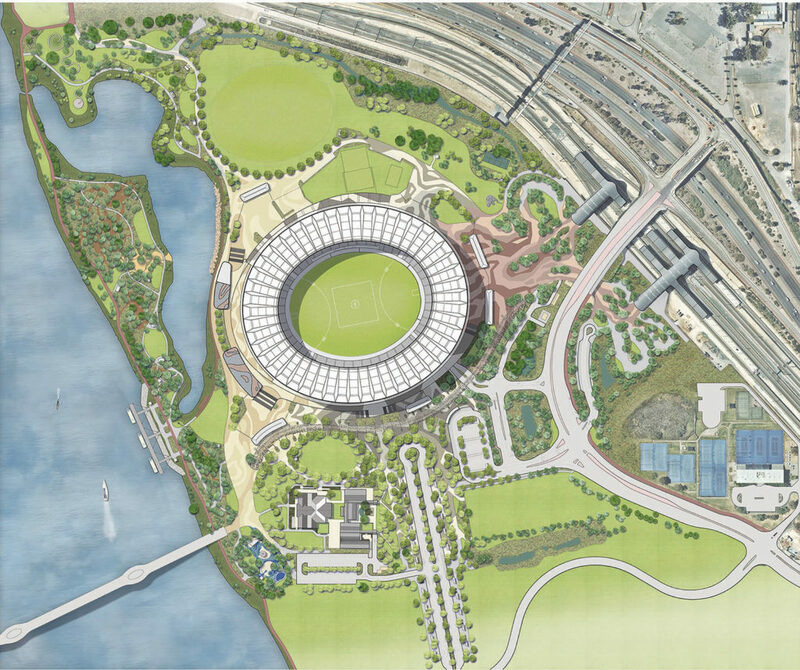 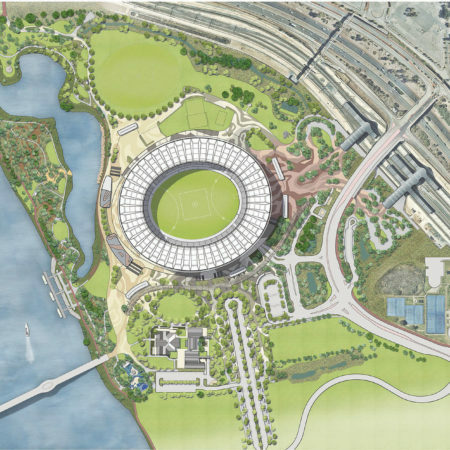 A community arbour links the new, HASSELL designed, Stadium Station to the Swan River, BHP amphitheatre, the playgrounds, picnic areas and the BHP boardwalk; and a community sports oval is available for public use on non-game days.